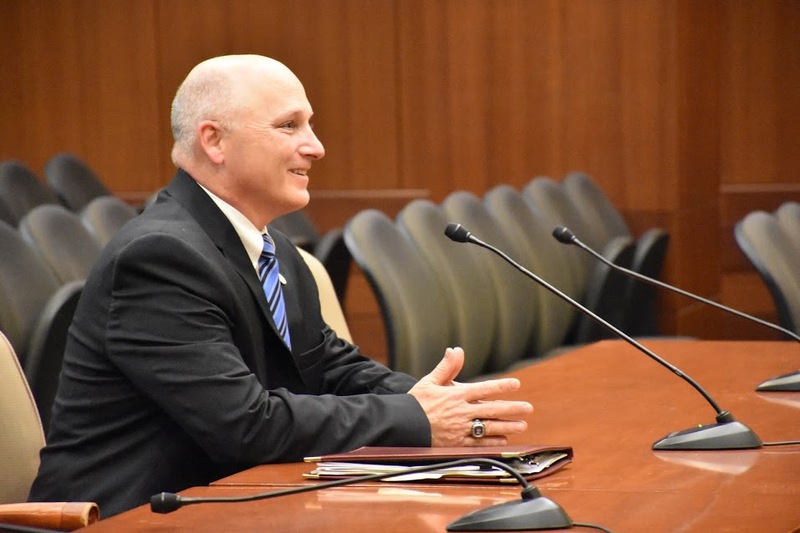 The Board of Supervisors for the University of Louisiana System today named Daryl Burckel the seventh president of McNeese State University. He is an accounting professor at McNeese and a former department head. Burckel, a native Louisianian, is a two-time graduate of McNeese State University where he was a member of the football team. He received his doctorate in business administration from Mississippi State University. The UL System community descended on the State Capitol Wednesday for UL System Day at the Capitol. About 800 students, faculty and staff lunched with legislators and encouraged Louisiana’s leaders to invest in higher education. Additionally, the System’s university presidents had breakfast with Gov. John Bel Edwards. The theme of the day, #InvestULS, reached nearly 300,000 people on social media. 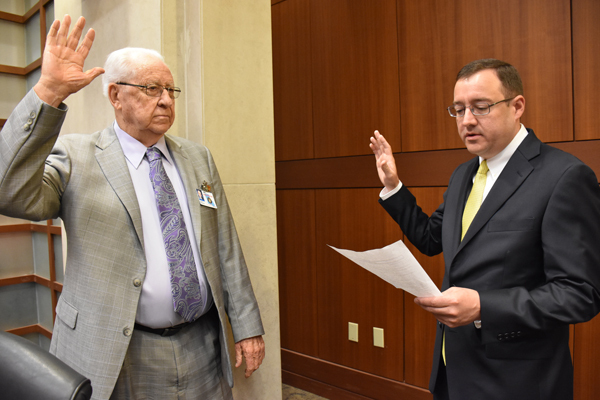 Johnny McFerren was sworn in as the newest UL System Board member. He was appointed by Gov. John Bel Edwards March 17. McFerren, a resident of Stonewall, represents the 4th Congressional District. He served as a state representative for 16 years. He is a retired teacher and owner of McFerren Real Estate. Jeremy Evans, DeSoto Parish Clerk of Court, administered the oath of office. Grambling: approval to award an Honorary Doctorate of Humane Letters to Mr. Marc H. Morial at the Spring Commencement Exercises. LA Tech: approval of the Bachelor of Science in Instrumentation and Control Systems Engineering Technology (ICET) program. Northwestern: approval to award an Honorary Doctorate of Humane Letters to Mr. Stewart Ewing at the Spring Commencement Exercises. Northwestern: approval of a Proposal for a Post Baccalaureate Certificate program in Magnetic Resonance Imaging. Northwestern: approval of a Proposal for a Post Baccalaureate Certificate program in Invasive Cardiovascular Technology. Southeastern: approval of Memoranda of Understanding with the following universities: (a) Universidad Cristobal Colon, Veracruz, Mexico; (b) Universidad Santo Tomas, Colombia; and (c) Universidad de Cartagena, Colombia. UL Lafayette: approval to offer the Master of Science in Informatics degree program. UNO: approval to enter into an Urban Studies and Planning Pathway Agreement between Delgado Community College and the University. UNO: approval to enter into an Urban Studies and Planning Pathway Agreement between Northshore Technical Community College and the University. UNO: approval to award an Honorary Doctorate of Humane Letters to Brigadier General Chad P. Franks at the Spring Commencement Exercises. Grambling: approval of a contract with Mr. Freddie Murray, Head Women’s Basketball Coach, effective April 1, 2017. Northwestern: approval of a contract with Mr. Brad Laird, Associate Head Men’s Football Coach, effective February 27, 2017. Southeastern: approval of a contract with Ms. Ayla Guzzardo, Head Women’s Basketball Coach, effective May 3, 2017. UL Lafayette: approval of a contract with Dr. Bryan Maggard, Athletic Director, effective March 1, 2017. ULM: approval of a contractual amendment with Mr. Mike Collins, Defensive Coordinator/Assistant Head Football Coach, effective March 1, 2017. ULM: approval of a contractual amendment with Mr. Matt Kubik, Assistant Head Football Coach/Offensive Coordinator, effective March 1, 2017. ULM: approval of a revised Athletic Home Game Complimentary Ticket Policy. Grambling: report of results of the consultant’s report regarding a new library. LA Tech: approval to demolish a greenhouse on the University’s South Campus. LA Tech: approval to demolish Hutcheson Hall located on the University Campus. LA Tech: approval to demolish McFarland-Jenkins Hall located on the University Campus. LA Tech: approval to exchange property with the Louisiana Tech University Foundation along with all improvements. Nicholls: approval to enter into a Ground Lease/Lease Back Agreement with the Nicholls State University Foundation to replace the artificial turf football field at John L. Guidry Stadium. Northwestern: approval to enter into and execute a Ground Lease Agreement with Christus Health Northern Louisiana, or its parent, subsidiary, affiliate or other related company, for a Parking Lot. Northwestern: approval to enter into a Facilities Lease with the Demons Unlimited Foundation, Inc., pursuant to authority vested by La. R.S. 17:3361 for the site of the scoreboard area at Turpin Stadium for the primary purpose of making facility improvements. Southeastern: approval to demolish Twelve Oaks, a former cafeteria and reception hall. Southeastern: approval to demolish the Vera Thomason Health Center. ULM: approval of the Board of Supervisors for the University of Louisiana System for the execution of a Ground and Buildings Lease Agreement and an Agreement to Lease with Option to Purchase between the Board, on behalf of the University, and the University of Louisiana at Monroe Facilities, Inc.
ULM: approval to purchase a vacant lot located at 707 North McGuire Avenue, Monroe, which is currently owned by the ULM Foundation. ULM: approval to enter into a Ground Lease Agreement with ULM Foundation to construct a new Foundation and Alumni Building and to purchase the improvements back from the Foundation. Northwestern: approval to waive non-resident fees for any non-resident student whose parent has earned at least an associate degree from any regionally accredited college or university in Louisiana. ULM: approval to establish the Willis-Knighton Endowed Professorship for Nursing and the Michael H. Woods First Generation Endowed Undergraduate Scholarship B.
UNO: approval to convert the Freeport-McMoRan Inc. Chair of Human Resources Management into three Professorships: (a) Freeport-McMoRan Inc. Endowed Professor in Business I; (b) Freeport-McMoRan Inc. Endowed Professor in Business II; and (c) Freeport-McMoRan Inc. Endowed Professor in Business III; and to convert Freeport-McMoRan Inc. Chair in Strategic Marketing into three Professorships: (d) Freeport-McMoRan Inc. Endowed Professor in Business IV; (e) Freeport-McMoRan Inc. Endowed Professor in Business V; and (f) Freeport-McMoRan Inc. Endowed Professor in Business VI. University of Louisiana System: approve Campus Housing and Meal Plan Rates, Auxiliary Rates, Energy Surcharge, HB 152, and Non-Governmental Charges for Academic Year 2017-18. University of Louisiana System: approval to authorize a 5.75% employer contribution rate for employees in the Optional Retirement Plan of Teachers Retirement System of Louisiana, in accordance with Act 607 of 2014. UL Lafayette: approval to continue the appointment of Dr. Gwen Fontenot as Interim Dean of the B.I. Moody III College of Business Administration effective February 1, 2017.